Last week I made some “Zupa Tuscana,” a complete ripoff of one of the soup choices from Olive Garden. 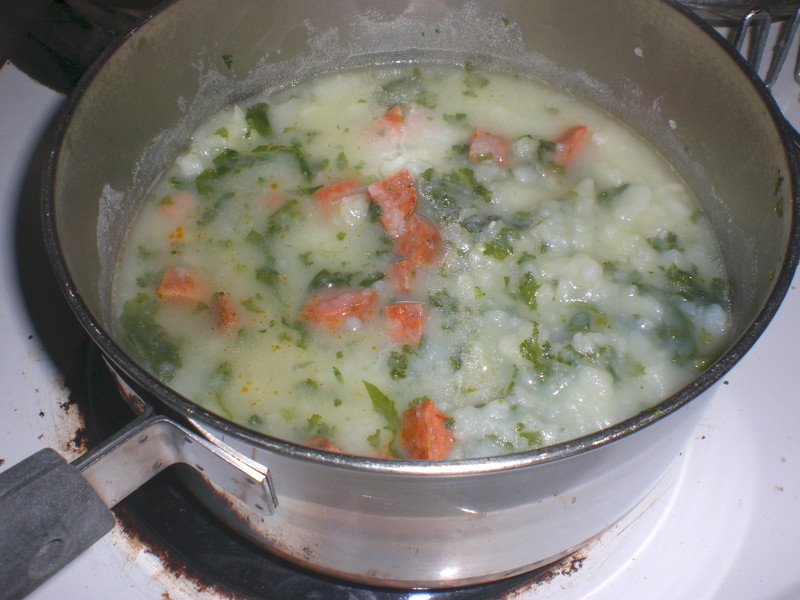 For those of you not addicted to breadsticks, this is a potato and kale soup, with chunks of sausage. My home version was with homemade stock, and I actually went out and bought kale for it, something I swore never to do after having a glut of it two summers ago when our CSA would bring 2 or 3 bunches of it a week. The soup was pretty good, got a thunbs up from DH, who is not usually a soup lover, unless that soup is called chili, and smothering a burrito. I decided to make it again, but make it less…soupy. I wanted it to have a mashed potato vibe… I believe there’s and English dish called bubble and squeak, which is mashed potatoes and cabbage (English food!? Too ethnic?) which I have read about, but never tried. The name is interesting, anyway. So, I peeled and sliced some potatoes, set them up to boil with boullion to cover. For two potatoes, two cups of broth were about right. 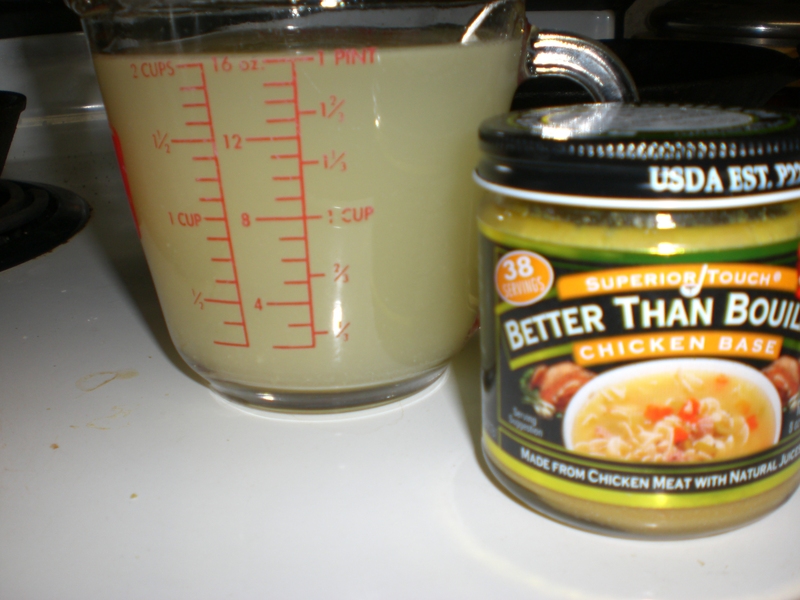 I’m out of homemade stock, and Better than Boullion is a good substitute. If you’ve never tried it, do. The name is accurate, it is better than boullion. 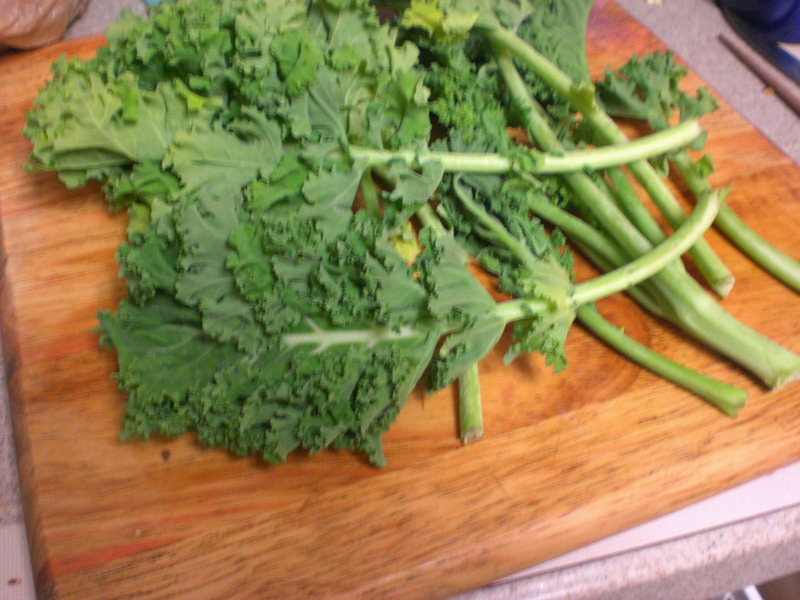 I then sliced some kale into thin strips, and put it in when the potatoes were almost tender. After a week in the fridge, the kale was a little the worse for wear- what was too gross for the soup went into the compost bucket, with a little leaf for the hermit crabs. Once the potatoes were all the way tender, I mashed them without draining off the broth. I added some pre-cooked Italian sausage at this point. No photos of those- I tried, but they all came out weird. I usually fry up a batch of Italian sausages at one time, and put the extras in the freezer. The texture of the soup is somewhere between soup and side dish- serve in a bowl rather than a plate. With unlimited breadsticks, if you have them…mmmm, wish I had unlimited breadsticks.